Psycho Fox is a Sega Master System game developed by VIC Tokai and published by Sega in 1989. It is a platform game, starring Psycho Fox who must rid the land of an evil god named Madfox Daimyojin. Psycho Fox is second in a line of similar platformers by VIC Tokai, succeeding the 1988 Famicom release of Kakefu Kimi no Jump Tengoku: Speed Jigoku (released in the West in 1990 as Kid Kool and the Quest for the Seven Wonder Herbs), and predeceeding the 1990 Sega Mega Drive game, Magical Hat no Buttobi Turbo! Daibouken (which was extensively reworked to become Decap Attack when released in the West). 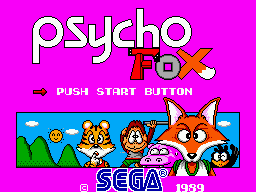 Due to a typo, some European cartridges are labeled as "Psyco Fox". In Brazil the game was re-released in 1995 with graphical changes as Sapo Xulé Vs Os Invasores do Brejo. Main article: Psycho Fox/Magazine articles.